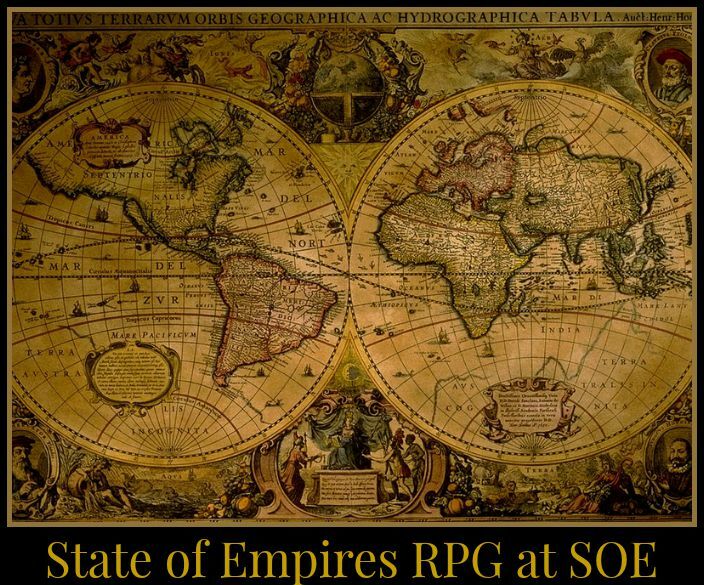 State of Empires' vision is to open the world of historical fiction across the continents and time frames of history. It is a Realm not looking to rewrite history but to provide an arena for you to expand your creativity within a particular period and place. We ask that all role play be to a period of history that did exist. That the culture and traditions of the period be honored. State of Empires is not a framework for revisionist history, nor adding elements of fantasy to a particular period of history. The Realm is a place to weave creative stories, through the eyes of history. Turn your imagination loose, and make history come alive! A king, a prince, a warrior! Facts can be far more interesting and exciting than fiction! Come and explore here where History feeds the realm of imagination! Flash your way through the roaring twenties as a gangsters moll or merry ole England as princess fair. A warlord of far east! Or a geisha of Japan! History has provided us with an unending template to paint our scenes and build our empires! We invite you to leave your mundane cares, step back in time and carve your own little niche in our world! A world of history, romance, cultures, customs and chivalry where all are welcome. Chat Services Provided by Cyber Help, Inc.
Copyright©1995-1998 by Cyber Help, Inc., All Rights Reserved.